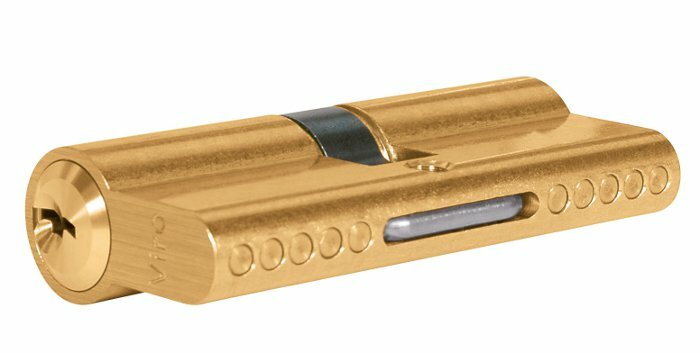 In order to provide high levels of security, a cylinder must therefore be able to effectively withstand all the various types of attack. This is the first in a series of articles in which we will delve into the characteristics which a cylinder must possess to best withstand these attacks. Brute force attacks are by far the most commonly used methods in burglaries (27% of the cases, according to ISTAT), since they do not require great technical expertise, special skills, or specialist tools. The first characteristic necessary for a high security cylinder is therefore to be able to withstand as much as possible these types of attacks. Drilling the body so that the pins and counterpins drop downwards and thus emerge from their seat, leaving the plug free to rotate. Drilling the plug (rotor) to release the pins, pushed by the springs, from above, or simply to insert tools with which to extract it. In both cases the aim is to have free access to the cam of the cylinder which controls the movement of the lock (so that it can be rotated and opened), or to directly reach the lock mechanism and operate it. Breaking it, pulling it out and/or knocking it inside by force A cylinder can be pulled from its seat in various ways, but the aim is always to gain access to the lock so that it can be freely opened. 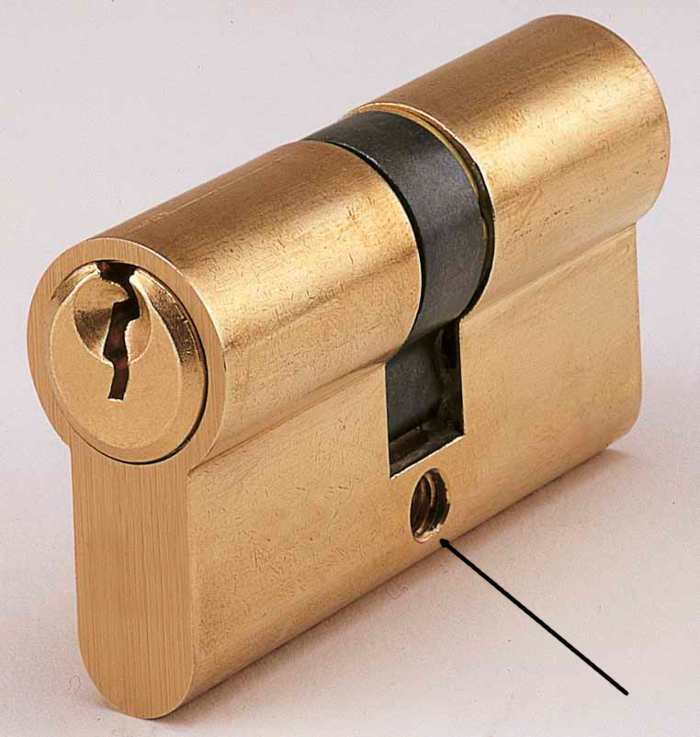 To withstand attempts to open using brute force, a cylinder must therefore have both anti-drill and pull-resistant reinforcements. 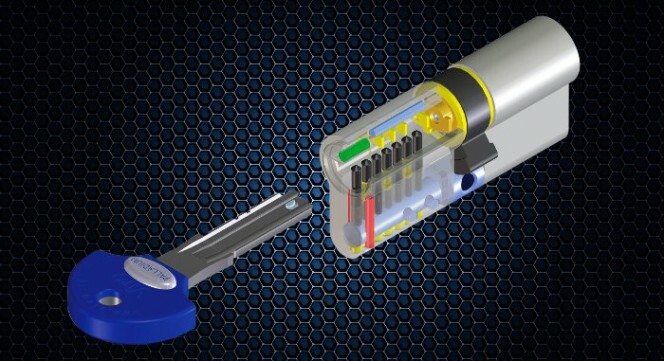 High security cylinders have special reinforcements, on both the body and on the rotor, made from drill-resistant materials to withstand the action of drill bit. Generally, they are additional pins, but even the pistons themselves can help to perform this role. Viro Palladium high security cylinder. The anti-drill pins in the body are highlighted in red and the anti-drill pin in the plug is highlighted in green. In this case, the pins and the counterpins (highlighted in black) also have an anti-drill function, since they are made of AISI 420C tempered stainless steel. 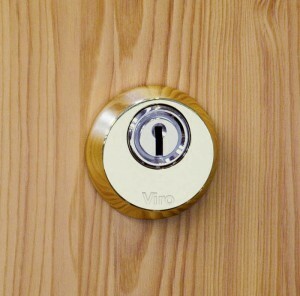 To further defend the cylinder against drilling is advisable to protect it with a security escutcheon (i.e. a protective shield/boss), which as well as obstructing drilling with its specific structure, is able to house a rotating drill-resistant plate, which is an even more effective protection than fixed pins. A security escutcheon by Viro protects the cylinder against attempts to drill it, both on the body (thanks to its structure) and on the plug (with a rotating drill resistant plate). If you look at a European cylinder from the side it can be seen how the body, at the cam, is machined to allow rotation of the cam, and beneath the cam there is a threaded hole, where the screw which secures the cylinder into the lock passes through. A European cylinder: the arrow indicates the structurally weakest point. 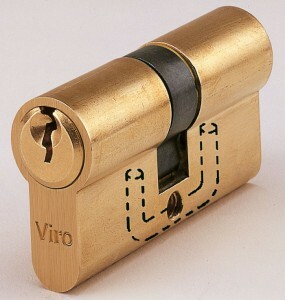 The part of the body under the cam, as it is thinner, is an intrinsically weak point in the standard form of the European cylinder, which thieves can take advantage of by attempting to break the cylinder in two precisely at that point, in order to withdraw the outer half and knock the other half inside, thereby trying to have free access to the lock. To withstand this attack, the first precaution is to install the cylinder so that the outer face is flush with the door. Any protrusions can be exploited by burglars to strike the cylinder with a hammer and chisel or to grip it with tools designed to pull or break it. 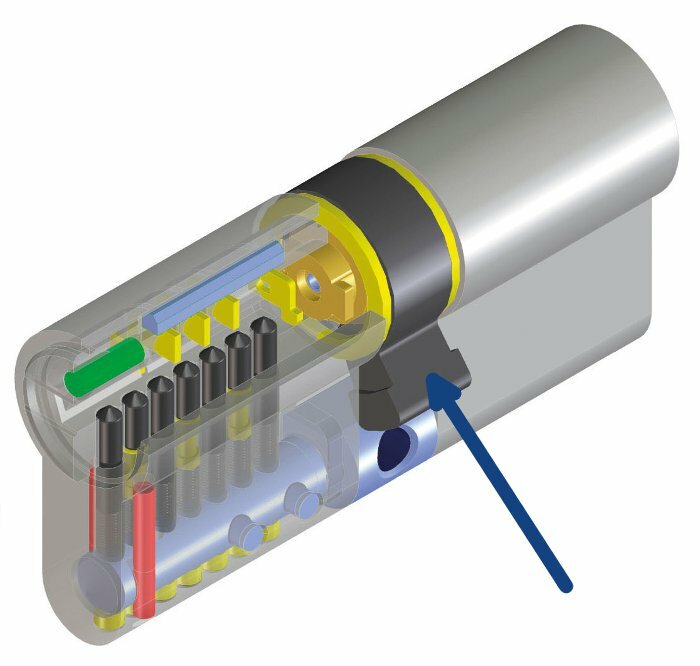 However, high security cylinders offer an additional protection, provided by pull-resistant reinforcement, which makes it harder to break the cylinder and, above all, even if it is broken, resists attempts to pull the two halves apart. 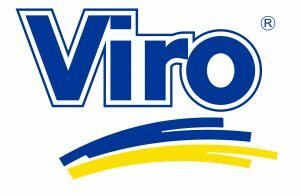 The dashed line shows a type of pull-resistant reinforcement used on various Viro cylinders. It is a bar made of AISI 304 U stainless steel in the shape of a “U” which obstructs attempts to break the cylinder and tends to keep the two halves together even in the unfortunate event that the cylinder is actually broken. At the centre of the cylinder one can see the pull-resistant steel reinforcement. A security escutcheon is also able to provide very effective additional protection against pulling out attempts, thanks to its truncated cone shape, and its installation is always recommended when seeking greater security. In future articles we will look at other features which a cylinder must have to be able to withstand various types of attack. However, already from this first analysis one can understand how, despite the standard outside shape of the profile cylinder, there is an extraordinary variety of European profile cylinders with different characteristics which satisfy the various needs. For example, on interior doors and generally where a large level of security is not required, simple and reliable models can be used. On the other hand, where high security is required, such as on doors with access from the outside, it is important to choose products which have the appropriate characteristics to withstand possible attacks in the most effective manner.